The 'Wallis Simpson' Dress by David Fielden in Ivory. It is a truly exquisite dress. The top half is silk with intricate rose detailing on the front. The back opens to reveal a glimpse of skin and the waist is emphasised. The skirt a full tulle skirt, which moves effortlessly. It was very much admired on the day for its originality and cut. The photos do not fully do it justice. One point to note, which cannot be conveyed in a photograph, is how lightweight the dress is relative to other bridal wear. It is incredibly comfortable, easy to move in and I felt truly at ease in it. 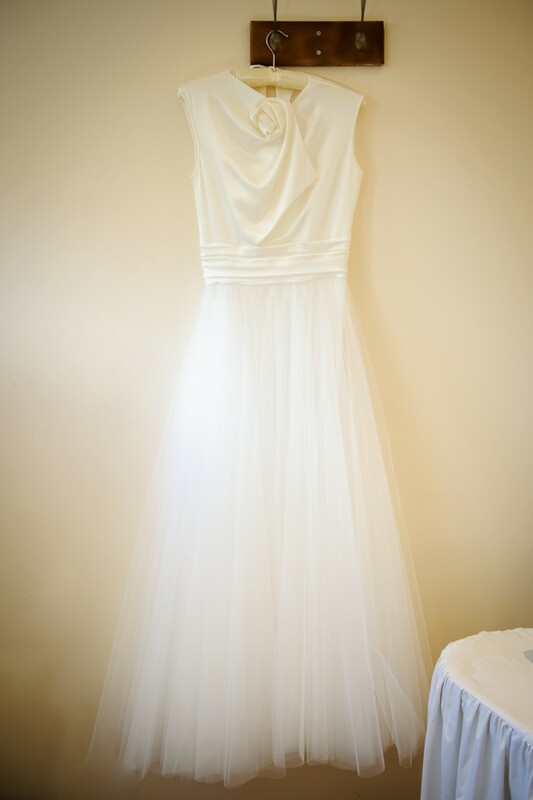 It is in excellent condition having only been worn once on my wedding day. It was bought new for £2000. It is a catwalk size 14, but fits a high street UK 10-12. The length has been altered for a 5'5 bride wearing 3 inch heels. Since bought it has been hung in its dress bag in a smoke-free, pet-free house. I live in Winchester, Hampshire and would be happy to arrange a viewing and to answer any further questions.